**Once you click search, select the products tab on the left hand side to see all of our images available relating to your search. NEW music video release: "To make you known"
Richards Outdoor Photography collaborating with Ross King and Wes Taylor's "To Make You Known"
For years, informed hunters and wildlife managers have known that one of the best methods for improving your deer herd is to manage by age. Observing & Evaluating Whitetails, a book by Dave Richards and Al Brothers, can help you do that. Acclaimed wildlife photographer, Richards, and renowned deer biologist and creator of quality deer management concepts, Brothers, blended their skills to produce an amazing book showcasing some of the most impressive whitetail photography ever assembled. The book's beauty is only over- shadowed by its usefulness. With more than 400 stunning photos the book craftily teaches how to age not only by physical characteristics but also by behavior. The authors support their conclusions with photos chronicling the lives of dozens of known-age bucks that Richards has followed and photographed for years. Special sections by noted whitetail authorities Dr. Larry Marchinton and Brian Murphy instruct readers on aging after harvest, diseases, whitetail communication, and sensory capabilities, making this book a must-have. Observing & Evaluating Whitetails is offered in hard bound version for $39.99 and a leather bound signed limited edition is available for $199.99. Aging Whitetail Bucks on the Hoof pocket guide is an excerpt from Observing & Evaluating Whitetails and is available for $4.99. Click link on the left to order books directly from Quality Deer Management Association. 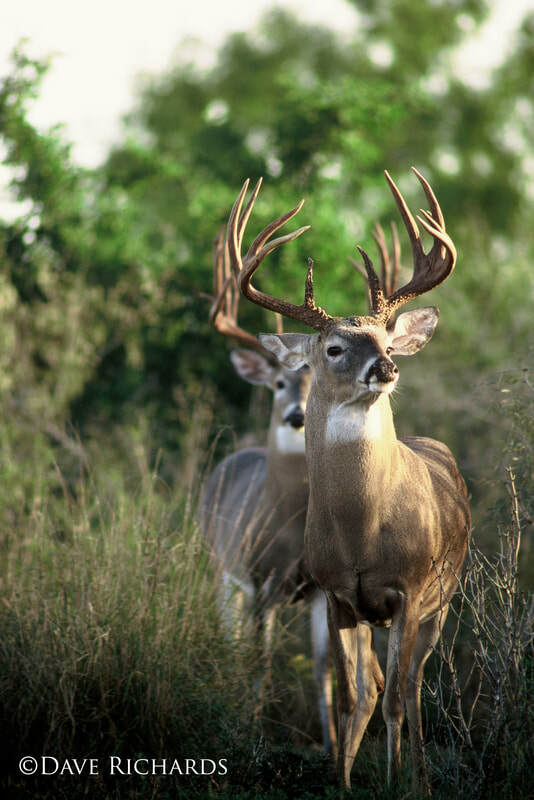 Inspired by Stickers, a legendary native Texas whitetail. Drawn from Dave Richards' most recognized image that serves as the cover of his book Observing & Evaluating Whitetails. Stickers is the pinnacle whitetail of his book whose life of eight and a half years is chronicled throughout its pages. He has graced numerous covers of outdoor magazines from Sports Afield to Texas Trophy Hunters. Beth's artwork is available in note cards as well! 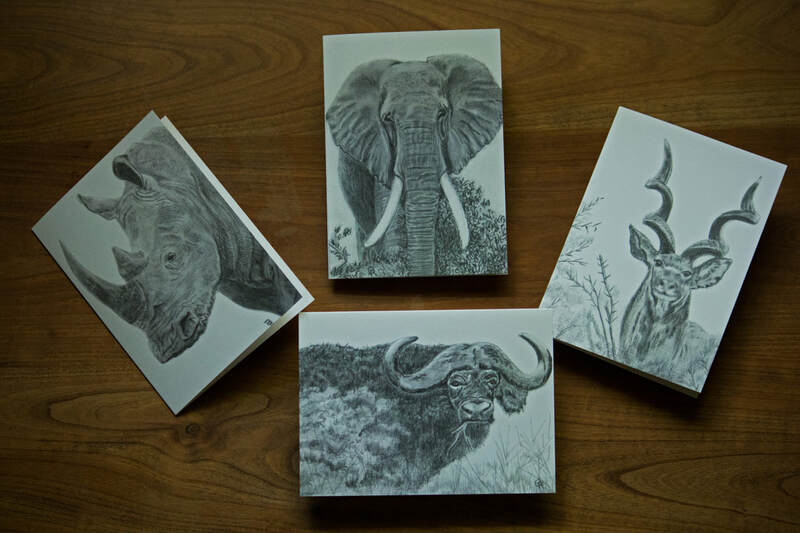 Check out these new cards drawn from her experiences on her recent African safari. For God so loved the world, that He gave His only begotten Son, that whoever believes in Him should not perish, but have eternal life. For God did not send the Son into the world to judge the world, but that the world should be saved through Him. All images in this website are copyrighted, original photos by Dave Richards, James Richards, Joseph Richards, and Beth Richards. Each and every image is protected by United States and international copyright laws. Using any of the images and or content from this site for any purpose what so ever is strictly forbidden without the expressed, written permission from Dave Richards. Please contact Dave Richards directly for the licensing of any use, and/or purchase of these images.